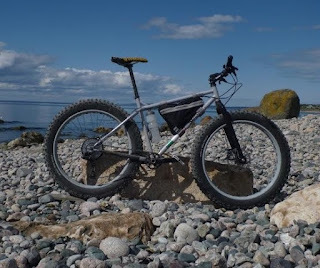 been drooling over fatbikes on-line and at your LBS. So what do you buy? There are plenty of decent fatbikes on the market with a plethora of options and variations to tempt your fat pallet. 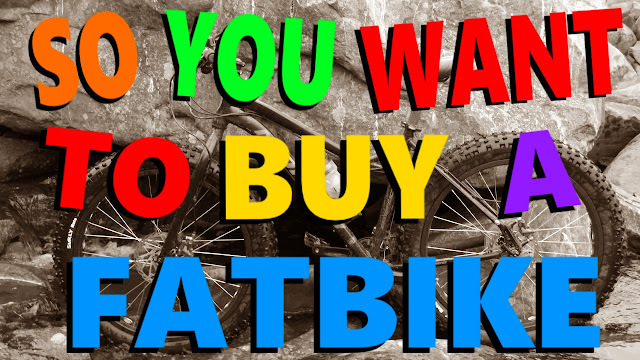 Here are my top 10 considerations for buying your first fatbike. If you have very deep pockets, a budget for your foray into fatbiking may not be a concern. However, if you are like most folks your money tree has yet to bloom. Fatbikes can start at several hundred dollars and climb to the stratosphere. So the first step in getting your fatbike is to set a budget . . . with a little wiggle room. If your plan is just to ride snow for fun, you may not need a myriad of mounting points for bags and cages. If your goal is to explore the wilderness, a bike build for speed may not be the best choice. Many people buy a fatbike for winter use only and quickly realize it is a capable and fun four season bike. To be honest . . . they are all great choices. My current ride is aluminum yet I have taken a steel for a spin and I have whipped around on a carbon. Each have their own list of characteristics, good points and bad points. For example steel is heavier, more resilient, easier to repair and is relatively inexpensive. While carbon is lighter, more fragile, tricky to fix and quite costly. Find a bike that fits and take it for a spin. Take a look at this steel and carbon beauty melding the best of both worlds. Mechanical brakes are generally cheaper than their hydraulic brothers. Both will stop you from going over the edge of the earth and both will freeze if they get wet and cold enough. However, hydraulics do have extra stopping power that is always nice. There are all sorts of gear choices out there from the super cool 1 x 12, 1 x 11 to the ultra reliable 2 x 10. For those a little more adventurous there is the single speed option, however I'm not sure how well that would work off road. A lot of manufacturers are moving to a 1x platform as many people (including myself) have upgraded from the stock 2x system. If you feel more comfortable going with a 2x for the extra low gear capabilities . . . then go for it. Tires are expensive. 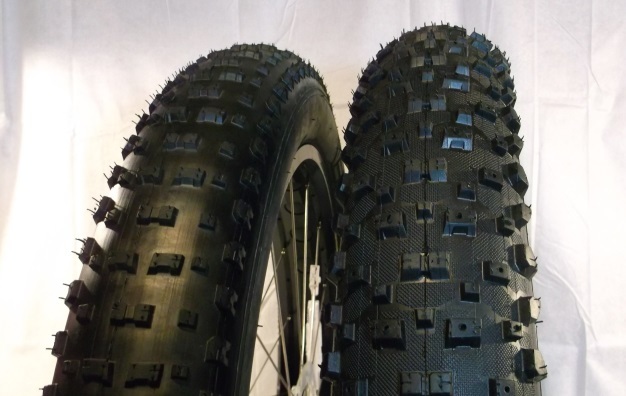 A couple of years ago there were only a handful of fatbike tires on the market. Just about every tire manufacturer now have at least one fat offering, with some manufacturers (like Vee) offering tires in different rubber compounds and even colours. Most bikes come with decent tires for most types of terrain. I do prefer a higher TPI count (120 vs 60) as the tire is more subtle and rides smoother. If purchasing your fattie from a LBS they may cut you a deal on a second set of tires or upgrade you for a few bucks. Where I ride we get a lot of ice before the snow decides to stay put. You only have to go down on ice ONCE and you will be buying studs. Studded tires are costly, but if you have an extra set of tires you could look at Grip Studs or if money is scarce you could stud your tires with screws . . . but that will ruin them for any other type of riding. The best time to purchase studded tires is in the off season when they are taking up valuable shelf space needed for summer gear. A 4" tire is just fine for winter riding, however a 5" will give a little more float on the white stuff. During the non-snowy season the smaller tire is much lighter and quicker, yet the 5" tire will offer oodles of more traction and stability. If you are considering running anything larger than a 4" tire then you will have to consider rear spacing. The most common rear spacings are 170mm and 197mm (135mm on some older fatties). Many manufacturers have moved towards a 197mm x 12 as the larger the rear end spacing, the larger tire you can run. Personally, I have run a 5" tire with a 170mm and a 1x drivetrain with additional slight drivetrain modifications. You do not really need front suspension in the winter. Its a nice to have for the few bumps, but it adds weight and may cause issues in really cold weather depending on the fork. A carbon fork is generally a better option for the powder. A suspension fork is definitely a welcome addition when ditching your mountain bike during the summer, and you can always add it later. Just make sure the frame is suspension corrected. 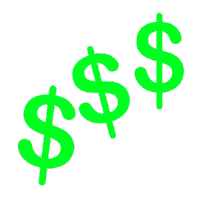 Before you lay down the cash, be sure to take the bike for a spin. Sometimes the bike will look right on paper, but when sitting in the saddle it may just not "feel right". I'm sure there are other things that could be considered, however this Top 10 should help you narrow down your first fatbike purchase. Have fun and ride on. Great article... thanks for the solid advice. I took the plunge and bought myself two Charge Cooker Maxi 1 and 1 Charge Cooker Maxi 1 for my wife. We have seven bikes between us but the fat bikes are the most fun summer or winter. Will never ride a regular mountain bike or a 29r again. We are very thankful for our fates. I see you subscribe to the N+1 theory of bike ownership. :-) Fatbikes are indeed fun all year round. Cheers. Thanks for the helpful info on fatbikes. I recently got a Salsa Beargrease that comes with 27.5 wheels and 3.8 tires. I do wish during Winter riding that I had more float with my tires. I’m wondering if I switched to 26 wheels with 4.8 tires I would get more float. I remember reading that 27.5 3.8 would have equivalent float to 26 with 4.8 tires. Not sure if I believe this.